Back in October 2013 Ken McGoogan came out with his new book 50 Canadians Who Changed The World . That's it - just 50! As you can imagine, arguments about who was included and more importantly who was not included began soon after, rocketing this book up the best-sellers lists. This book isn't your standard list of greatest Canadians. Instead of the typical patriotic chest thumping this book looks at the 50 most important Canadians (they had to be born in the 20th century - thus explaining Lester B. Pearson's absence) from the viewpoint of people outside of Canada. Global reach was the defining factor. People like Tommy Douglas, Pierre Trudeau, Romeo Dallaire, Margaret Atwood, Alice Munro, David Suzuki, Michael J. Fox and James Cameron. Now any book about the top Canadians as seen by Canadians would include a few hockey personalities. So how does the author handle Canada's defining sport from a global perspective? McGoogan includes three hockey personalities. Many Canadians might find that to be too small of a number but realistically the world's view on hockey, with the exception of a dozen countries or so, is pretty small, too. Wayne Gretzky, of course, is included. (There is no numerical ranking of the honourees.) As the author points out, Gretzky transcended the sport in America and as a result has, in many ways, given the game to the world. He is the face of the game, and for many he is the face of Canada. Jacques Plante is also included, for literally changing the face of the game by introducing the goalie mask. Hailey Wickenheiser is also included along with deceased freestyle skier Sarah Burke, for their immense influence in advancing women's athletics worldwide. Does any other hockey player deserve mention? While Rocket Richard's cultural impact in Quebec is unparalleled, his reach did not extend beyond Canadian borders. Bobby Orr, Bobby Hull, Gordie Howe, Jean Beliveau, Mario Lemieux - all amazing hockey players, but not one of which I think had any significant global reach, especially off the ice. The very few hockey players I can think of who deserve such consideration are immediately eliminated because they are not even Canadian - Borje Salming, Vladislav Tretiak and Slava Fetisov. Realistically I think McGoogan is bang on in including only these three Canadian hockey players. I may even be willing to drop Plante off the list (but only if McGoogan drops Celine Dion. I mean, c'mon!). 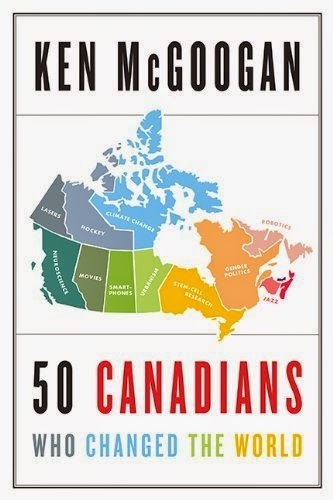 Ken McGoogan 50 Canadians Who Changed The World should be required reading in Canada. He offers an interesting and entertaining history of Canada from a different angle. I do recommend checking out this book.